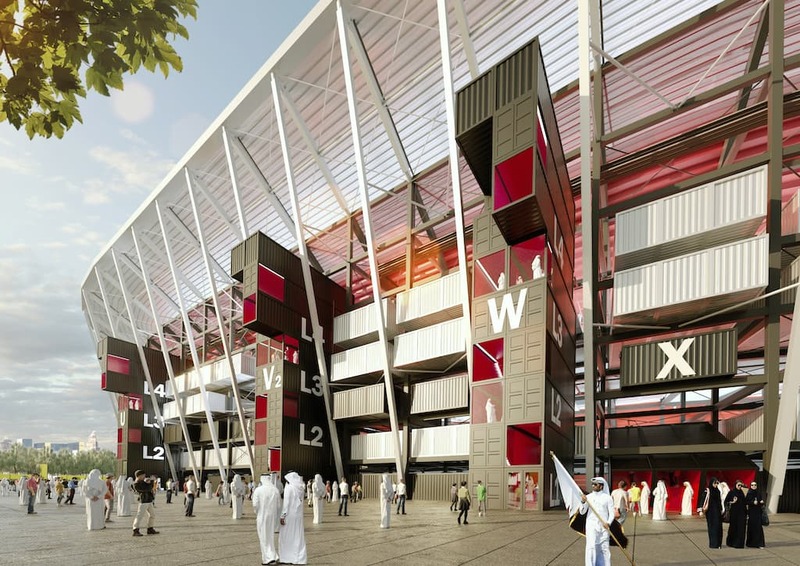 In June, organisers of the Qatar 2022 FIFA World Cup approved a batch of sample modular containers that will be used to construct the ‘Lego-like’ Ras Abu Aboud Stadium. Due for completion in June 2020, the 40,000-seat Ras Abu Aboud Stadium will be the first major stadium to be created out of modular containers and the first-ever World Cup venue to be “detachable, mobile and recyclable”. TheStadiumBusiness spoke to Fatma Al Nuaimi, communications director for Qatar 2022’s Supreme Committee for Delivery & Legacy, to get the lowdown on the project and the progress of other World Cup venues. TheStadiumBusiness: Firstly, could you tell us about the main design features of the Ras Abu Aboud Stadium, and what makes it unique? Fatma Al Nuaimi: Ras Abu Aboud Stadium champions a bold and innovative design concept never before seen in a FIFA World Cup venue. Built using modular building blocks, each containing removable seats, concession stands, lavatories and other fundamental stadium elements, Ras Abu Aboud Stadium combines tournament experience and legacy planning in a revolutionary way to create a truly unique venue. Challenged with creating a venue that offers a world-class atmosphere and fan experience as well as unrivalled legacy benefits, our design and construction teams, working with internationally renowned Fenwick Iribarren Architects, broke the stadium down into conceptual ‘building blocks’ and created a new design concept. TSB: Could you tell us about the modular ‘building blocks’? Al Nuaimi: The modular building blocks Ras Abu Aboud Stadium consists of are modified shipping containers, each containing fundamental stadium elements that can be quickly and sustainably assembled and disassembled at various locations as required, all in pursuit of our mission to ensure the 2022 FIFA World Cup Qatar leaves a lasting legacy for the country and the world. Ras Abu Aboud’s modular design also means construction of the venue will require fewer materials, create less waste and reduce the carbon footprint of the building process, all while reducing the time taken to build the stadium to as little as three years. Thanks to this sustainable approach to the stadium’s construction, Ras Abu Aboud will receive a four-star Global Sustainability Assessment System (GSAS) certification. TheStadiumBusiness: How is construction progressing? 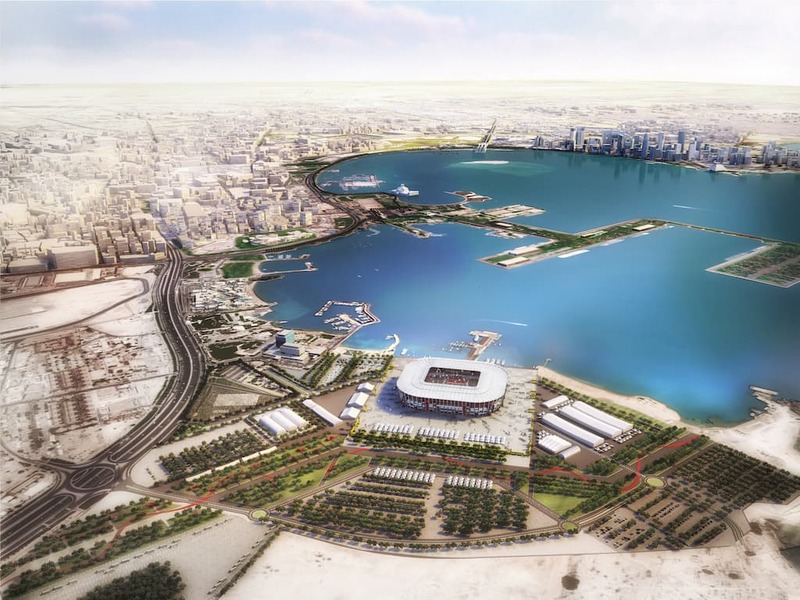 Al Nuaimi: The 40,000-seat venue is slated for completion in 2020 and will be located in a 450,000m2 waterfront site on Doha’s shore, where the use of shipping containers as one of the main building blocks will echo the nearby port. Situated just southeast of Doha and just 1.5km from the state-of-the-art Hamad International Airport, it will be serviced by excellent transport links, including a dedicated stop on Qatar Rail’s Gold Line, direct road connections to the centre of Doha and Al Wakrah, and potentially even a water taxi stop. TSB: How does the Ras Abu Aboud Stadium fit into the overall construction project for Qatar 2022? Al Nuaimi: We are working to a budget of around QAR 23bn (roughly $6.5bn) and we’re very happy with the progress we’ve made on our stadiums since construction began in 2014. 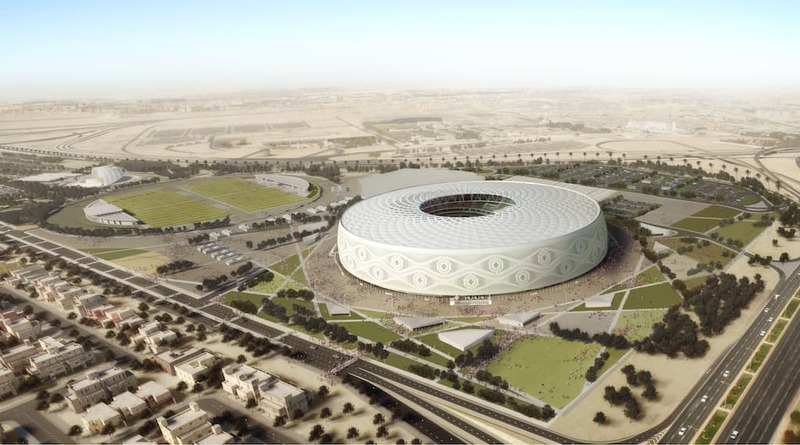 Khalifa International Stadium, Qatar’s first tournament-ready venue, was launched more than five years ahead of the tournament when it hosted the Emir Cup final, Qatar’s domestic league cup, in May 2017. We’re planning to launch two venues early next year, Al Bayt and Al Wakrah Stadiums, and all eight of our venues will be finished by 2020 – well before the tournament begins. TSB: Who are the main partners behind the project? Al Nuaimi: We’re very keen to use the opportunity the FIFA World Cup presents to further the diversification of Qatar’s economy into new sectors. As part of this, one of our approaches has been to partner local construction companies with leading international companies in joint venture contracts for our stadiums. This model builds local capacity by enabling Qatari organisations to work with the best in the business, and we’ve used it to great effect on all but one of our stadiums. Ras Abu Aboud Stadium is the first venue we are building to use only one contractor – a Qatari company that has absorbed expertise from earlier projects which it shared with international contractors. As for the design of our venues, we’ve worked with some of the world’s leading international architects to create Arab-inspired venues that leave no doubt that this is a unique event: the first FIFA World Cup in the Middle East. My personal favourite is Al Thumama Stadium (pictured below), which has been designed by Qatari architect Ibrahim M Jaidah. This is inspired by the ‘ghafiya’ headdress worn by Arab men, particularly young boys, across the Arab world. TSB: What is the overriding vision behind the project and what key goals must be achieved? Al Nuaimi: Although Russia set a very high standard with the 2018 FIFA World Cup, we’re confident our preparations will offer football fans, players and officials alike an unforgettable experience. Not only is Qatar one of the safest countries in the world, making it particularly popular with children and families, but all our state-of-the-art, Arab-inspired tournament infrastructure lies within 50km of the centre of Doha, promising a compact festive atmosphere throughout the tournament. Just four hours’ flight for two billion people, Qatar is also centrally located to make travel convenient for fans, some of whom may never have had the opportunity to see a World Cup live before. We’re looking forward to extending a warm, Qatari welcome to millions of visitors from every corner of the globe in 2022. But we also see the first FIFA World Cup to ever take place in the Arab world as much more than a 28-day tournament. This is an immense opportunity to educate the world about our region by using the power of football to bring people together. It is also a vital part of Qatar’s national development plans, accelerating government initiatives and infrastructure to help make Qatar a healthier, more sustainable country for future generations. In short, we’re ready to break the mould and set a new benchmark in terms of mega sporting events and their legacy. TSB: What have been the key challenges associated with the project so far and how have they been overcome? Al Nuaimi: Qatar has generally coped well with the illegal blockade imposed by its neighbours last year. As you’d expect with a project of this size and importance, we’ve had contingency plans in place that meant we were able to respond quickly to the blockade by setting up alternate supply routes with countries such as Oman, Iran, Turkey, Pakistan, China and Malaysia. Today, it’s very much business as usual and we are on schedule across all of our projects.